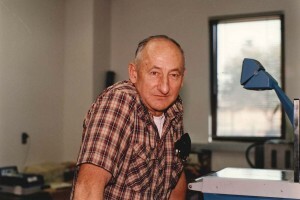 Lloyd Luedecke, above, working in his WSU classroom circa 1995, spent more than 50 years advising and teaching students in the School of Food Science. Today, a scholarship in his name helps students follow in his path. Over his 50 years as a teacher and mentor, Lloyd Luedecke made a big mark on Washington State University food science programs and the Northwest dairy industry. Six months after his death, Luedecke’s legacy lives on through a scholarship that helps students attend WSU’s School of Food Science. Luedecke taught and advised students in the School of Food Science from 1962 to 2000, then stayed on as professor emeritus for more than a decade. Former students remember his knowledge, professional attitude and always-open office door. “He really knew the students,” said Russ Salvadalena, manager of the WSU Creamery since 2000. “Of all the faculty members here, he was the one who was able to keep up with food science graduates the best. He had a genuine concern. “Learning from Dr. L in the classroom and labs was always very straightforward,” said Marc Bates, a student of Luedecke, who managed the Creamery from 1973 to 2000. One of Luedecke’s strengths, Bates said, was his ability to listen, asking just enough questions of students to keep them thinking until they reached their own conclusions. One of the professor’s greatest joys, said Bates, was hearing from former students about their trials and successes, promotions, job searches, marriages or newborn children. “He was there to listen and to share in their joy or sorrow,” Bates said. Throughout Luedecke’s career, food companies would call him to find promising student recruits at WSU. Many of these students now serve in leadership roles in the food industry. “His legacy today is the untold number of students he taught and advised who are productive and effective citizens, regardless of where they are,” said Bates. 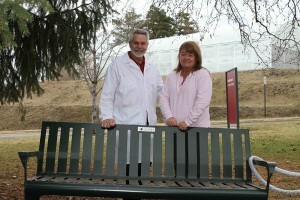 Russ Salvadalena, manager of the WSU Creamery, and Carol Hanson, daughter of the late Dr. Lloyd Luedecke, visit the memorial bench dedicated to the professor. Last fall, Luedecke’s family donated funds for the bench to create a space where his students, friends and colleagues could remember him. Photo by Seth Truscott. A stickler for quality, Luedecke served for decades with professional organizations that promoted safety standards. Luedecke spent 26 years as secretary-treasurer of the Washington Association for Food Protection (WAFFP), and was inducted into the Hall of Fame of the Washington Milk and Food Sanitarians Association. He was instrumental in starting WAFFP’s endowed scholarship, which helped dozens of food science students get their start in industry jobs. Outside of work, Luedecke’s colleagues remember him as an avid athlete and sportsman. Luedecke loved fishing, traveling yearly to his cabin and angling spot in Saskatchewan. He bowled on a team of WSU faculty for many years, was a regular at racquetball tournaments around the state. After initially retiring from teaching in 2000, Luedecke served as a Food Science professor emeritus for another 12 years, retiring in 2012. He died June 4, 2014, at age 79, of complications from Alzheimer’s disease. Luedecke’s family requested that memorial donations be made to two funds benefiting students. The first, the WAFFP/L.O. Luedecke Endowed Scholarship, is given yearly to two WSU food science students. In recent years, the scholarship has averaged about $1,600 per year. In 2015, Luedecke’s family will make a $10,000 donation to the endowment. The family seeks help from Luedecke’s former students, colleagues and industry partners for an additional $10,000 match by June 30, 2015. The resulting funds would provide $800 in scholarship money annually. That’s something that Luedecke would have been proud of, said Carol Hanson, Luedecke’s daughter and a Pullman resident. Another endowment, the Undergraduate Food Science Activity Endowment Fund, honors Luedecke and several other individuals. It supports undergraduate classes, club field trips and activities, and visits by special speakers. Luedecke was a regular at the Creamery and Ferdinand’s Ice Cream Shoppe. For nearly all of his time at WSU, Luedecke served as the Creamery Faculty Advisor. As professor emeritus, Luedecke was a member of the Creamery’s management team and attended many conferences and meetings as a representative for WSU. He helped select scholarship winners, and advised the School of Food Science on student recruitment and retention. Luedecke also often helped the Creamery sell cheese during home football games. He never turned down an offer of a Ferdinand’s milkshake, loving peanut butter shakes and “anything with berries,” said Salvadalena. At the bench, the late professor’s friends can sit and remember. Hanson encourages them to do exactly that. Learn more about donating or the scholarship.